Marcus Buckingham was all-the-rage a few years back. He landed on the map after writing a NY Times Bestseller, Now Discover Your Strengths. It was "ok" in my opinion. Summary: you are really good at a few things. Focus on those core strengths and delegate your weaknesses. 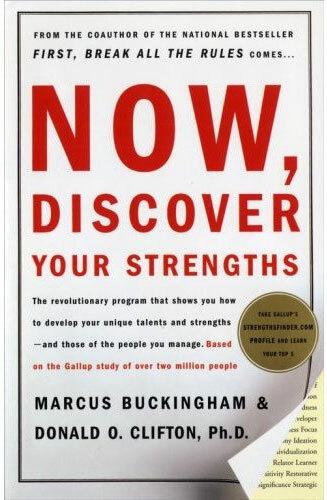 To find your strengths, the book offers a exhaustive personality test. I believe the test has been refined since Buckingham, check out StrengthsFinder 2.0. Deliberative - People strong in the Deliberative theme are best described by the serious care they take in making decisions or choices. They anticipate the obstacles. Competition - People strong in the Competition theme measure their progress against the performance of others. They strive to win first place and revel in contests. Significance - People strong in the Significance theme want to be very important in the eyes of others. They are independent and want to be recognized. Belief - People strong in the Belief theme have certain core values that are unchanging. Out of these values emerges a defined purpose for their life. What strength do you think most identifies me? What are your top 5?